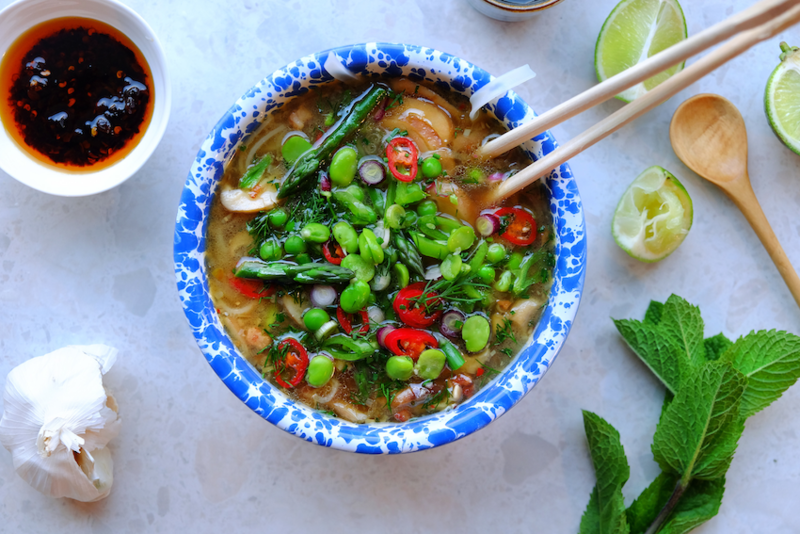 We are cheating slightly calling this a pho – as it isn’t one really, its our British adaption that is a wonderfully light and fragrant broth with a British twist. We make Asian broths and soups all the time, but the Vietnamese Pho is a particular favorite, they are so quick and easy and supper healthy – cleansing and very good if you are run down. Pho traditionally is eaten for breakfast so why not add an egg on top and take to work with you if feeling authentic. If you are making at the weekend or with some spare time by all means go ahead and make your own stock (simmering water with bones of your choice, veg and herbs for a few hours), if you don’t have time like us most evenings then pick up some good quality stock, in this recipe we use chicken stock but if you are vegetarian vegetable will be just as delicious – you can also substitute the pancetta for shitake mushrooms if staying off the meat. The base of the soup is very ‘phoy’ with garlic, chilli, ginger, star anise and we are using normal cinnamon sticks, although if by an Asian supermarket and can get your hand on Vietnamese cinnamon sticks they add a wonderful depth in flavor. After the broth has been simmering add your fresh crunchy greens – peas, broad beans, asparagus, sugar snaps, the great thing is that they don’t need to be cooked in advance (even peas from frozen). Just straight into the pan then serve immediately to keep them nice and crunchy. Then decorate with herbs, toasted sesame seeds, spring onions, chilli and condiments of choice (chilli oil and hoisin are good). 1. Heat the coconut oil in a pan over a medium heat and add the pancetta, cook for a few minutes till starting to crisp 2. Add the shallot, ginger, garlic, chilli, lemon grass, lime leaves, cinnamon stick and star anise, sauté for about 5 mins. 3. Add the fish sauce and stir, then add the white wine and chicken stock, simmer for about 20 mins 4. While this is cooking cook the rice noodles to the instruction on the pack and leave to the side. 5. Add the soy sauce, honey, lime zest and juice to the broth and taste. Add the crunchy greens and herbs. 6. Divide the noodles between 4 bowls then dived the broth, decorate with and garnishes you wish and serve.